Here, Eyeball This! : Here, Eyeball This! Aaron begins grad school, fearful that he can’t compete. He’s about to form powerful friendships and learn how physics and spirituality intersect. Meet Hiroshi, who enjoys beer and trying new words, with hilarious consequences. You’ll laugh out loud when he battles Dennis Miller. Timil has trouble with physics and a harder subject, baseball. Yen likes bathroom graffiti and the Bible. Dr. Jacob teaches Aaron about the true origin of the universe, while Roche and Grace impact his life in fantastic ways. Together they face the dreaded qualifier, a comprehensive exam standing in the way of the prize. When Aaron detects signals from Leila, an undergrad beauty, uncertainty rules. She’s his student, which makes misreading the signals costly. Then a trashcan provides a golden opportunity for Aaron. But is it one that he can accept? This is a rare novel that looks realistically at modern scientific life, a much better way to break the wall between the “two cultures” than the usual methods of research memoir or popular-science explainer. “Here, Eyeball This!” tells the tale of a physics graduate student who wrestles with issues familiar to all scientists, such as coping with culture clash in the melting-pot of modern research; facing the competitive pecking order amid very smart people; and dealing with the qualifier exam, which in difficulty and life-altering significance makes the SAT look like tic-tac-toe. It alternates between crass humor and high-level theorizing, just like real science, and thrives on coffee and unhealthy food at strange hours, just like real post-grad life. It’s fun, irreverent, interesting and rings true.—David Brooks, the Nashua (New Hampshire) Telegraph. I was curious about this novel. First I assumed it was a college thriller, after having read “The Rule Of Four” by Caldwell and Thomason for which they got $400,000 in advance. Heddle could have been stimulated to write likewise. Then I thought of Grisham. I had never expected that such boring profession would lead to this heap of lawyer-related books, but Grisham showed otherwise. A novel about math and physics? What does that lead to? Exciting quadratic equations? But Heddle proved me wrong. He didn’t produce another thriller, he wrote a great campus story and he wrote it from an insider’s angle, and his truthful account made me laugh and cry and upset. Heddle is a born writer, he brings his characters to life; we can picture them and sympathize with them. He tells us about what’s going on in this secluded world of science and his remarks on Intelligent Design made me think. This is a novel that stands like a rock and I’ll be reading it over again. —Walter G. Willaert, author. A stunning novel that brilliantly evokes modern Christian challenges. It's a full-bodied, humorous novel sure to be savored by many.—Joshua Claybourn, InTheAgora. How much did I like Here Eyeball This!? Well, it occurred to me that if J.D. Salinger had continued to follow the experiences of dear Holden Caulfield into later adolescence and early adulthood, and Holden had become a physics major at CMU, Salinger could have written this book. But he didn't and you did, so congratulations. It is a beautiful book. I love it. —Jean Goldstrom, publisher, Whortleberry Press. Available now, in paperback, from Saga Books. Available now as an e-book by the Whortleberry Press. David Heddle was born in Pittsburgh. A physicist, he has a Ph.D. from Carnegie Mellon University. He has conducted postdoctoral research at the University of Maryland and the University of Illinois at Urbana-Champaign. He was an Associate Professor of Physics at Christopher Newport University, an Adjunct Professor at Daniel Webster College, and a staff member at The Thomas Jefferson National Accelerator Facility in Newport News, Virginia. He lives in New Hampshire with his wife, two sons, and Labrador Retriever. David Heddle's cv can be viewed here. You're from Pittsburgh? I should have known, a great writer like you. (I'm from Pittsburgh, too -- but the other side (Knoxville, on the hill above South Side.) That is surely the secret ingredient of your success. That, and the ability to write a great novel like "Here, Eyeball This!" 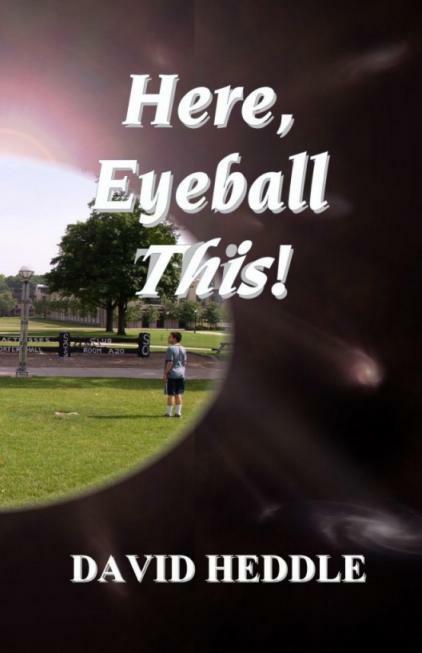 May "Eyeball" sell a zillion, and hit the NYT best-seller list! Dear David; Hello! I am so delighted to see you have gone on with "Here, Eyeball This!" I thought, and still think, it is a wonderful novel. I did not have quite the right audience for it at Whortleberry, nor the resources to give it the promotion it deserves. I am happy that you have found a paperback publisher which will give this outstanding novel the chance it deserves to find its readership. If you don't mind, I'd love to have your email address so I can put you on the "Whortleaves" mailing list, as you once were, so you can again receive updates on what is going on at dear ol' WhP. Meantime, best wishes for the continued success of "Here, Eyeball This." I hope you have written, or are writing, or will be writing additional novels. You have the ability.